-A fascinating investigation into the phenomenon of hemography in the life of the stigmatic and mystic Natuzza Evolo. Hemography is the process whereby blood from the stigmata or bloody sweat is miraculously formed into christian writing, images, and symbols upon hankerchiefs, bandages etc., presumably through Divine intervention. 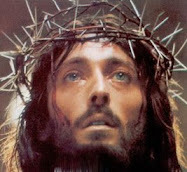 As blood from a mystic bearing the stigmata is symbolic of Jesus' Passion, the images, writings and symbols themselves often symbolise the Passion and other mysteries of the christian faith, especially also the Eucharist, as seen in the accompanying photographs in this article. 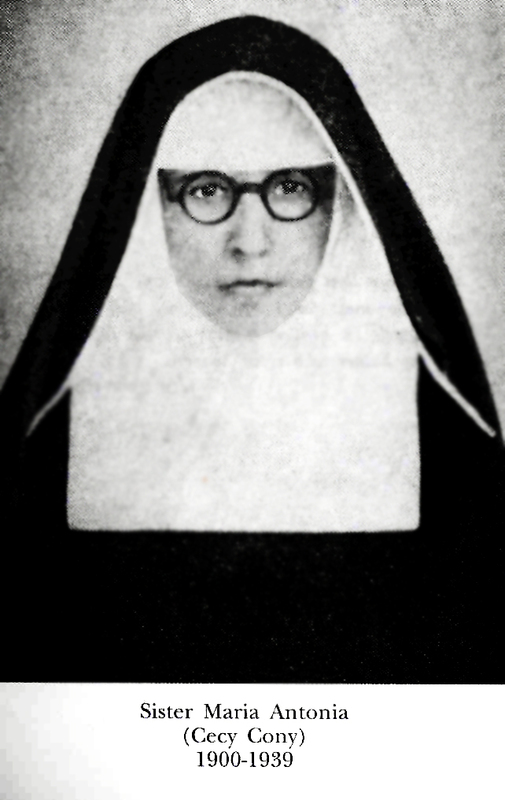 At the beginning of this investigation I must confess that I was very skeptical towards this phenomenon because I have only found its presence in the lives of two alleged mystics, Natuzza Evolo and Blessed Elena Aiello, and in the latter it appears to have only occurred on one occasion, when after some blood from her stigmata accidentally splattered onto the wall next to her bed, a miraculous image of Jesus suddenly appeared on the wall, formed from the blood itself, and remained there for many months. For sure, the authenticity of the hemographic phenomenon cannot be easily dismissed or discounted simply because this particular alleged mystical phenomenon cannot be documented in a wide range of persons, especially since in the case of Natuzza, we have hemographies occurring on literally many hundreds of occasions over the course of decades, and witnessed by a variety of scientific, medical and religious professionals, along with countless laypersons. Then too, in Natuzza we have a person of our modern age (died 2009) who has been studied and scrutinized by countless persons over the course of literally 75 years for the investigation of the variety of mystical phenomena which she is said to posess, yet she remains quite highly regarded amongst the Italian people from all spectrums of society. Much of the scientific and medical study of Natuzza’s mystical phenomenon (stigmata, bilocation, interaction with the souls in purgatory etc.) is documented in the book “Natuzza of Paravati” by Dr. Valerio Marinelli, published by the Foundation Cuore Immacolato Di Mari Rifugio Delle Anime, -English translation, Vol. 1, 2003. 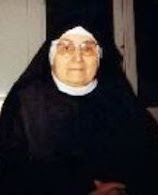 Although the Catholic Church has not made any pronouncements concerning her sanctity or the alleged mystical phenomena that occurred in her life, for most of her lifetime she had the strong support of her successive local Bishops, and at her death on the Feast of All Saints day (Nov. 1, 2009) there were six Italian bishops and more than 100 priests who concelebrated her funeral, along with 30,000 mourners from Italy and abroad. "For us she is already a saint, as she is in paradise," said Bishop Luigi Renzo of Mileto in his homily. And he continued “I am asked what the Church thinks of Mama Natuzza and the answer is in the participation in this ceremony of so many brother bishops and priests". See Zenit News article here. Certainly all noteworthy persons have their detractors, however the above list of facts should give ample evidence to the esteem that is held in majority by the Italian clergy, laity and scientific community for the person of Natuzza Evolo. 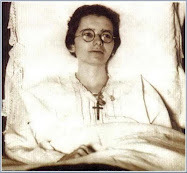 Before we begin our study of the hemographic phenomenon in the life of Natuzza Evolo, it would be beneficial to give a brief summary of her holy life. 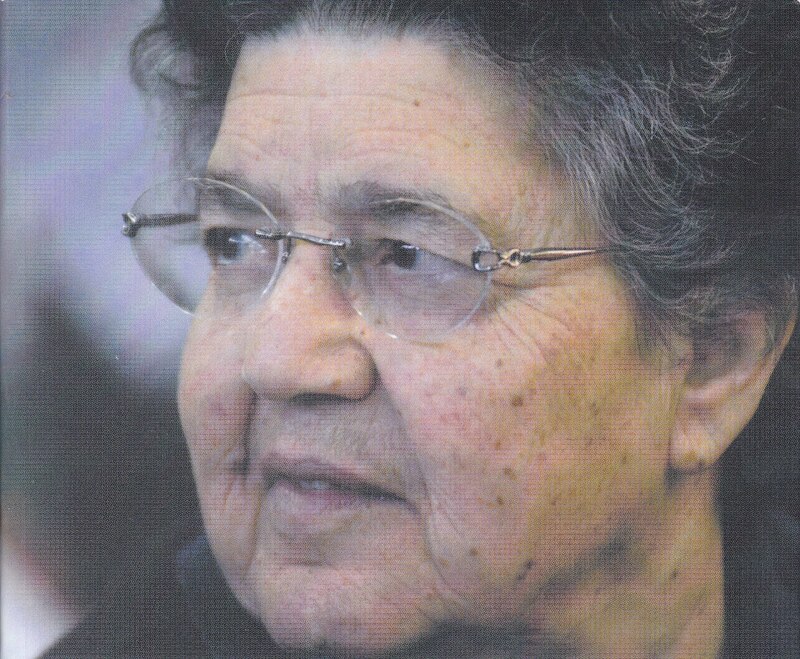 Fortunata (nicknamed "Natuzza") Evolo was born on August 23, 1924 in Paravati, a small town near Mileto Italy, and she has remained in the town of Paravati all of her life. 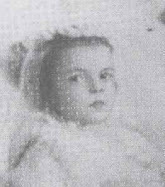 Her father, Fortunato, emigrated to Argentina to look for work a few months before Natuzza's birth and sadly the family never saw him again. 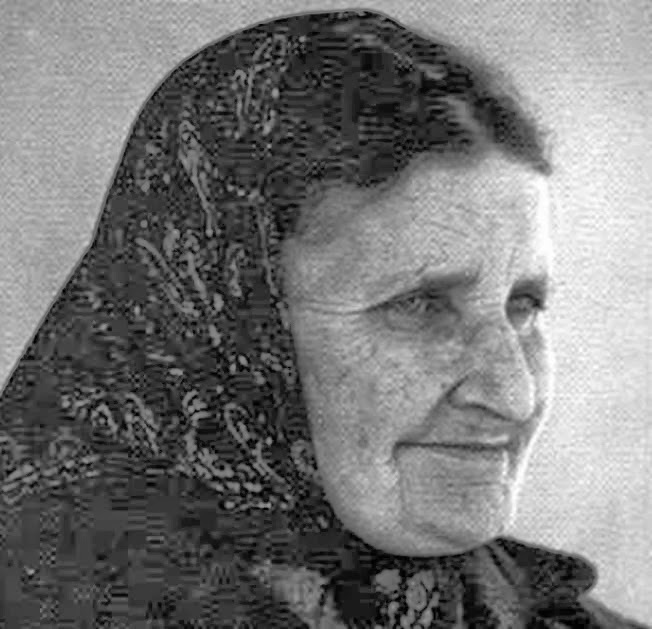 Therefore Natuzza's mother, Maria Angela Valente was therefore obligated to work to feed the family, and so at a tender age Natuzza sought to help her mother and brothers and was therefore unable to go to school, and so it was that she never learned to read or write. And this fact actually makes for an interesting addendum to the phenomenon of the stigmatic blood writing that is found in her life. In 1944 Natuzza married, a carpenter named Pasquale Nicolace, and together they had five children. 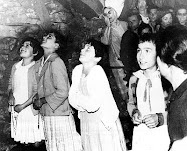 On May 13, 1987, with permission of Monsignor Domenico Cortese, the Bishop of Mileto-Nicotera-Tropea, Natuzza felt inspired by heaven to form an association called "Fondazione Cuore Immacolato di Maria Rifugio delle Anime" ("Immaculate Heart of Mary, Refuge of Souls Foundation." The Foundation was later formally approved by the Bishop. The foundation currently houses a chapel where Natuzza's remains are kept. As of this writing (2012), construction is well underway for a Church and retreat center as purportedly requested by the Blessed Virgin Mary to Natuzza. Those interested may see Foundation website here. 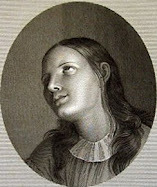 This incident at age 14 was the beginning of what would become a lifetime of mystical phenomenon including the stigmata or “wounds of Jesus” on her hands, feet, side and shoulder, along with bloody sweats or “transudations”, numerous visions of Jesus, Mary and the Saints, along with countless visions of the dead (primarily the souls in purgatory), and many reported instances of bilocation. Many of these mystical graces are documented in the aforementioned book “Natuzza of Paravati” by Valerio Martinelli. We will now begin our study of the hemographic writings in the life of Natuzza. 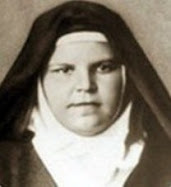 This mystical phenomenon reportedly first began in 1940 at age 16, and it continued in various degrees until her death on the feast of All Saints Day, November 1, 2009. The hemographies take place when her stigmata actively bleeds or when she sweats blood from various parts of her body (transudation), which is often during Lent and always on Good Friday. The phenomenon occurs when a handkerchief, bandage or garment touches the actively bleeding stigmatic wounds or bloody sweat. The writings and the symbols of the hemographies are always of a Christian nature; never have there been any symbols, images or words that did not have a Christian meaning. Without a doubt this phenomena is not subject to Natuzza’s own will, as many times people have approached her requesting a blood writing but it does not take place, even after numerous requests and attempts. Over the course of close to 70 years there is believed to be well over a thousand hemographies, but an exact figure is unknown. In his aforementioned book “Natuzza of Paravati”, Dr. Valerio Marinelli examined more than 100 hemographies, interviewing the persons involved and including many photographs of the haemographies in his book. The testimonies below are taken from this book. “My cousin Rosetta Ursetta, Natuzza and I had arranged to hear Mass together in the church “del Crocifisso degli Angeli” in Vebo Valentia, where the devotion to Friday's in Lent is devoutly practiced. It was the second Friday in Lent, 1972. We went to that church together with the nun named Suor Norina, who worked at Cantanzaro Hospital; we heard Mass but Natuzza didn't come. Upon leaving the Church we saw Natuzza was coming together with her husband; she was clearly ill, and her head was covered with a foulard, and she had some difficulty in walking. She desired to attend the next Mass and we went back into the church with her. At the moment of the Elevation of the Host, I noticed that her face was beaded with blood and I said with fear: «Natuzza!». Then she took a handkerchief and wiped her face and immediately some haemographic drawings formed on it, but unfortu­nately I don't remember them any longer. This handkerchief was then given to Rosetta. After attending the Mass, we went to Paravati all together; I re­member it was very cold and a stove was switched on. At a certain moment we saw that a wound on her wrist was bleeding; so I took my white handkerchief, and keeping it folded, I put it on that wrist. She kept it there for 20 minutes and then afterwards she gave it back to me. I un­folded it and found a wonderful haemography inside. 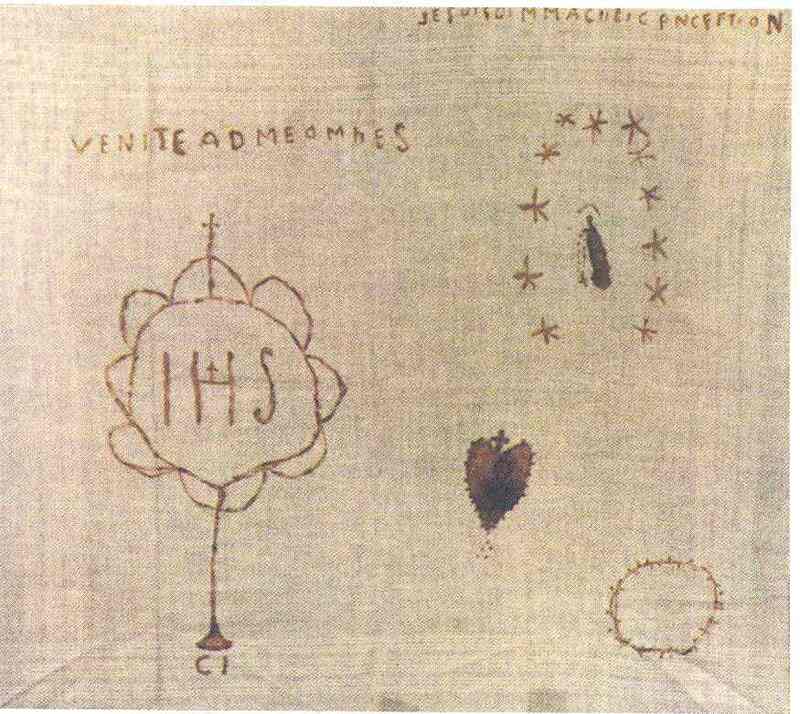 There was the writing PREGHIERA (prayer) at the top, a big monstrance with the letters IHS and CI on the left, a crown of thorns below and on the right, twelve figures representing mankind. These figures appear to be men, women, children, priests in front of Christ who held his arms open, on the left there was the figure of Our Lady watching them. Just closer to Our Lord we can also distinguish a Saint, with an aureole. If we watch the figure of Christ carefully, we can easily see that it is made of two images, one laid upon the other; the first is Christ's image with His Head leaning on the cross, and just behind there is the figure of God, the Father. I can definitely assure you about the authenticity of this phenome­non; that handkerchief was mine, I had just taken it out of my bag and, much more than this, the phenomenon had taken place under my own eyes. Moreover it had appeared in the middle of the folded handkerchief, per­fectly traced, with no blood stains around; I really can't explain that! I remember another occasion on which I saw another similar phenome­non. It was Lent and I was at Natuzza's together with my mother and Rosetta Ursetta. As my mother desired a haemography, I asked Natuz­za to content her. As soon as Natuzza put a gauze on her wrist, the blood drew an image of the thorn crown and a host immediately." Additionally it should be noted that Mrs. Rosetta Ursetta, an eye-witness, has fully confirmed Mrs. Man­telli's testimony above. "During Lent in 1974 or 1975 -I don't remember which year exact­ly - I drove with Rosetta Ursetta and Natuzza from Catanzaro to Paravati. It was early in the afternoon; since Natuzza was sitting near me, I could easily notice that her wounds were visible but not open. I gave her a handkerchief of mine and asked if she could put it on her wrist. When we arrived at Paravati, she gave it back to me. When we arrived at Paravati, she gave it back to me. Upon unfolding, the handkerchief showed drawings in the middle: there was a thorn crown, a heart made up of several little flames, the Host with the writing 'IHS' inside and a unknown figure". "It was Saint Joseph's Feastday. I had gone to visit Natuzza together with my son, Antonio, who was a student at Mileto seminary. Natuzza was suffering because of the wounds she had on her wrists, when all at once she fainted in a fit of pain. Soon afterwards she recovered her senses and we helped her to sit on a chest. We noticed that a wrist of hers, I believe the left one, was bleeding. Around it there was a white gauze which became partly red­ in color; in fact the image of a thorn crown and a host with the letters 'IHS' had appeared inside. We ourselves removed the little gauze from her wrist and I still keep it". Antonio, Mrs. Purrone's son, who was 12 years old at that time, told me he had got really frightened in seeing all that and added he was completely certain about the colour of the gauze which, from white, turned into red. "Ten years ago, during the Holy Week, my mother, my sister Carmelina, the chemist Amalia Giampa together with me and some other people decided to go to Natuzza in the afternoon. We found her in a painful situation; she had some sore wounds on her wrists. We noticed they were wrapped in some rather rough band­ages, which had been cut away from sheets; we all thought she would have suffered less if her wrists had been wrapped in softer bandages. I personally went to the pharmacy to get some bandages and gauzes. I then unwrapped the ones around her wrists, and I saw there were no haemographic drawings, then I put the new bandages around her wrists and bound up her hand. 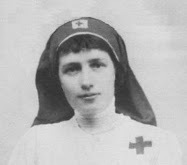 While I was taking the other hand, the gauze, that I had put on her wrist jew minutes before, fell on her lap with the part which had been in contact with Natuzza's wound facing up­wards towards us. 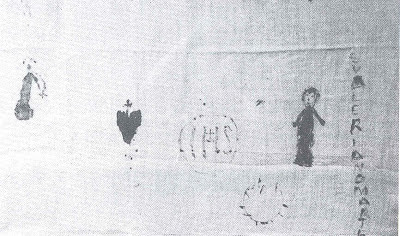 So we instantly all saw that the blood had formed the drawing of a host with the letters 'IHS' inside. It was, I want to say that again, the steril­ized gauze I had just bought and personally put on her wrist and I affirm that there were no other gauzes under the old bandages". This testimony was also confirmed by Anna's mother, Mrs Nerina Chimirri, and also by the pharmacist, Amalia Giampa. Natuzza's was at my home in Catanzaro; there were also my sis­ters Nella Perrelli and Rosetta Ursetta. At a certain moment, we noticed that her wrist was bleeding, so we asked her to produce a haemography for our nephew, Andrea Perrelli. Natuzza put a white handkerchief that I had given her before, on that wrist. She kept it there for ten or fifteen minutes then, she gave it to me. There were only some blood-stains on it; so I put it on the table and my sisters and I could easily see that the blood was moving by itself, writing letter by letter «S. Valeriano Martire». Then the rest of the blood mixed up and formed the figure of a Saint which we of course attributed to Saint Valeriano. 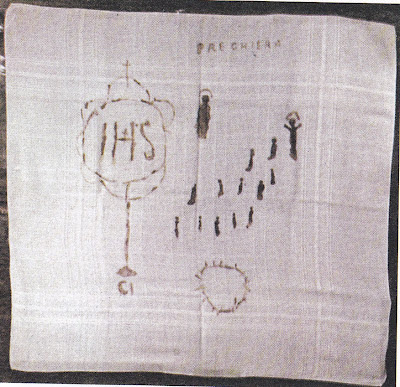 On this handkerchief there are also the figure of Our Lady hold­ing the Rosary, Jesus' Heart pierced through by a sword, the Host with IHS inside and a thorn crown. I can't say if these figures appeared contemporaneously or before or soon after the writing, because our attention had been completely caught by the blood moving and writing by itself. 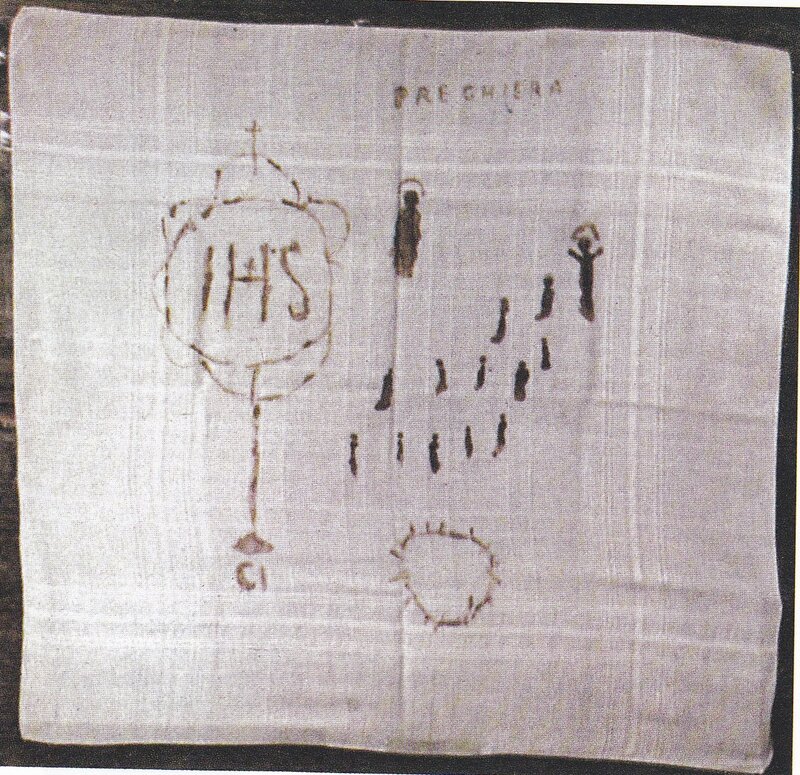 When we read the name appeared on the handkerchief, Natuzza said aloud: «But who is this Saint?...Does he exist?". Here Dr. Valerio Marinelli goes onto explain in his book: "Andrea Perrelli, the person to whom that haemography had to be given, told me that he had gone to Verona in the same year. There he had visited the Church of Fathers Pellegrini in order to see a statue representing Saint Valeriano, which, according to some people, seemed to have shed tears some time before. Moreover he told me that some of the Pellegrini Fathers, during a pilgrimage in Rome on the oc­casion of a Holy Year, found an urn in a church with this inscription on it: «The bones of S. Valeriano». On seeing that - he went on saying - they had become really sorry because they themselves kept a case containing S. Valeriano's bones, in Verona. Once they returned, they prayed to the Saint to make them know something precise about the bones they were saving in that case. When their prayers were over, they felt an intense smell of lilies, even though no flowers were around and, all at once, the stat­ue began shedding tears. Because of this, Andrea had a really deep devotion for that Saint, but neither Natuzza nor his aunts were aware of this at the time of the haemography." And so we have been presented with just a small portion of the eyewitness testimonies concerning the stigmatic blood writings that occurred through Natuzza. While these hemographies are perhaps seemingly strange or "odd" to our initial sensibilities, we can see that those who saw them occurring before their eyes were certainly inspired and edified, and also those who received them obviously treasure them as precious relics. 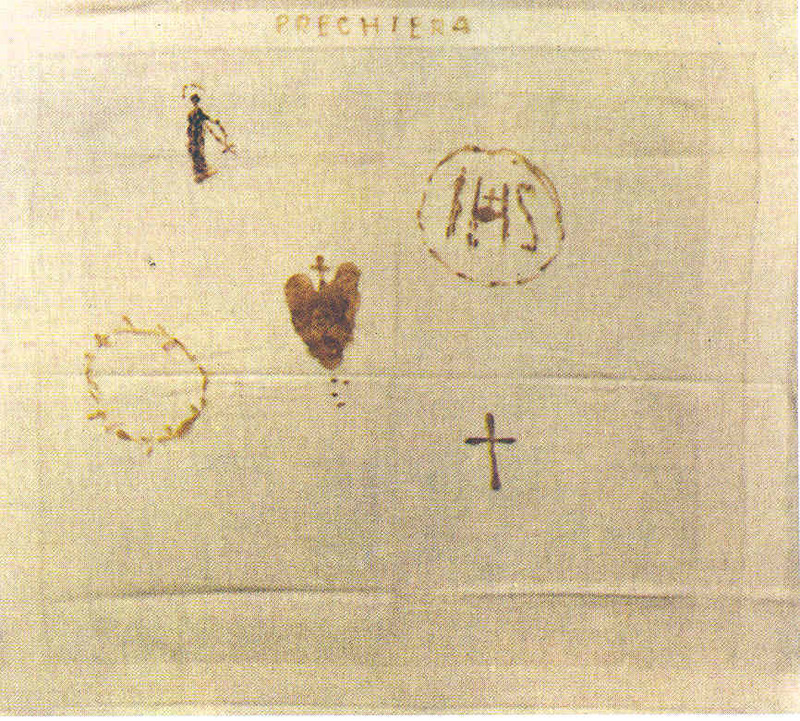 In conclusion one thing is for sure: if this mystical phenomenon is indeed authentic, then the symbolism that is represented through these images made of blood of the stigmata should inspire in us a deeper love, appreciation and devotion for the Passion of Jesus; for it is Jesus Himself in whose Passion the stigmatised mystically represent. One of the documented hemographies contains a lengthly written prayer devoted to the Infant Jesus. 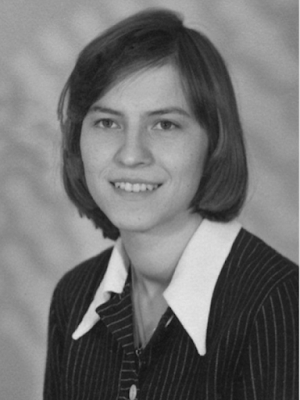 We often see how Jesus chooses the simple, humblest and most childlike persons for His works of love and devotion--and in this case, should it be surprising then that He perhaps chose a woman who never attended school, and who cannot read or write, to manifest this possibility of stigmatic blood writings? Interesting article, Glenn! 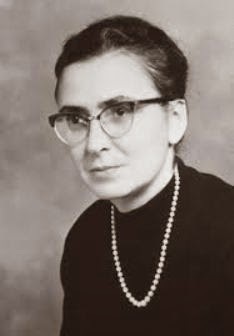 Natuzza Evolu was indeed a very holy soul with many incredible mystical phenomena attributed to her... and I agree that "Hemography" was one of the most intriguing. There are actually a few more Stigmatics besides Natuzza and Bl. 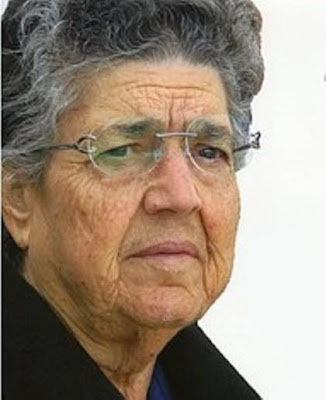 Elena Aiello who have exhibited this mystery, most notably are Sr. Rumolda Van Beek and Sr. Maria Teresa Pinol. 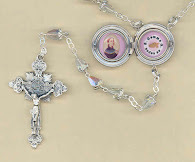 Even St. Padre Pio, on at least one occasion,displayed this gift during one of his bilocations. He reportedly bilocated to a sick woman in America to cure her and purposely left behind bloodstains in the shape of crosses on her bedsheet after the woman asked him to leave her proof of his visit. A similar phenomena is when stigmatic wounds appear as images or symbols on a person, which Natuzza also exhibited. There are stigmatics who bear cross-shaped wounds on their bodies such as Fr. Zlatco Sudac (forehead wound) and Bl. Anne Catherine Emmerich (chest wound). 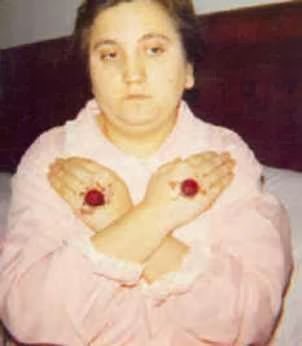 A mystic living today is said to be marked with a series of red welts that form a representation of a rosary on her arm in addition to the traditional stigmata. The Lord is full of mysteries and wonders, many of which we may never fully comprehend until we enter into Heaven. -Thank you for the great commentary! You bring out several excellent points which I was personally unaware of. It is interesting how you pointed out how the stigmatic wounds can occasionally appear as symbols on certain alleged mystics. This, as you know, was definitely the case also with Natuzza. It is another of the many interesting mystical graces that are given in abundance to the mystics of the Church. 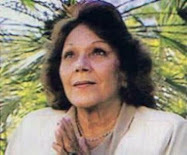 Was Natuzza Evolo also known as a psychic/medium and healer? It is not allowed for a Catholic to go to a psychic/medium. Also, did she ever meet Padre Pio? 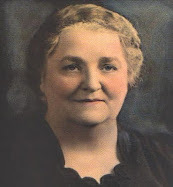 "Was Natuzza Evolo also known as a psychic/medium and healer? It is not allowed for a Catholic to go to a psychic/medium." Natuzza's (alleged) mystical gifts pertaining to what you are referring to definitely would not correspond with that of a "psychic or medium" because those titles have no basis or definition in Catholic mystical theology. Nor did she have the gift of healing in a strict sense. I will briefly explain her alleged mystical gifts from a Catholic perspective in reference to the line of your questioning. Natuzza was allegedly enlightened by heaven at times concerning certain events, present or future, outside the scope of her knowledge. Also, you asked "did she ever meet Padre Pio?" St. Padre Pio allegedly appeared to her through bilocation on numerous occasions. On one occasion, he touched her leg and cured her of a serious condition which at that time was inhibiting her from walking. She was certainly spiritually devoted to him, and in the book documented in the book “Natuzza of Paravati” by Dr. Valerio Marinelli there are some interesting details about the spiritual friendship. They definitely wrote letters to each other, as I recall reading that some of these letters are currently kept by the Foundation, but I will have to respond later as to whether they ever met in person though, because I don't have that information at the moment. Are there any books in English on Natuzza Evolo? 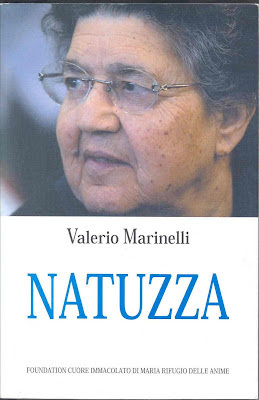 Yes, there is a book in english---"Natuzza of Paravati" (Volume I) by Valerio Marinelli, translated by Maria Virginia Basile, 2003, published by Foundation Cuore Immacolato Di Maria Rifugio Della Anime. I was happy you wrote about her and I was very sad you only focused on one of her great gifts. Natuzza: Two of her main gifts were talking to the dead and the gift of healing (either spiritual or physical one) Many persons who departed from this present life appeared to her just like you and me (although levitating about two inches from the floor) and asked her for holy masses, sacrifices, rosaries, fasts, etc to leave Purgatory or to lessen their sufferings. They told her why they went to Purgatory and how long they should spend there and what they needed to leave it sooner; stating they depend only on us on earth to alleviate their time there.They gave her their full name, date of death and (the location where their tomb where sometimes) plus information about their living relatives. Sometimes they gave messages or warnings to them through her. Sometimes souls from hell spoke through her giving full details why they were condemned and emphasizing hell is a place of eternal torment and they will never shall see God. Natuzza saw her Guardian Angel very often. She also saw and conversed with the Guardian Angel of the people who visited her.Her Angel translated for her in any language whenever she had to counsel (gave spiritual directions ) to whoever visited her.If the person was in mortal sin or had any illness (even if he/she was unaware of this fact) the Angel would tell her and she with much kindness and charity transmitted to the person in question.Most people were healed completely. She bilocated many times with her Angel as well.She saw and conversed with Our Lord and Our Lady often. She saw and spoke with Padre Pio, St Gemma, St Anthony of Padua, St Rita of Cascia, etc Satan appeared to her countless times in many forms (animals, ghosts, human) He attacked her many times physically. In one word Natuzza was a great gift from God to us in this age where materialism, unbelief, corruption, etc and so many false prophets are causing havoc in Church and society. I would highly appreciate if you would add some more info to her page. United in prayer. God bless. Thank you for your excellent comments! In this present article I wanted to focus on the fascinating area of hemography in her life, however in the near future I am hoping to write a additional article about her other mystical gifts, along with her extraordinary virtues. -Someone asked if Natuzza was healer, she was not at all.She herself used to say:"I am not able to do miracles,they are only done by Our Lord. I only pray and intercede for you because I am just an "earthen worm". It is really nice to meet you! Thank you so much for all the interesting information about Natuzza di Paravati that you provided. I have really enjoyed reading the book "Natuzza of Paravati" (Volume I) by Valerio Marinelli and I am very glad that you translated it, because unfortunately there is really not that much information about Natuzza Evolo in English. You mentioned that you translated her spiritual testament into English--I was wondering if that has been published yet? Anyway thank you once again Maria Virginia for your kind commentary. Dear Glenn, thanks for your reply which seemed to be in real time! Yes,that's true, the only one book translated is volume 1;but I think other translations will follow and I'll certainly let you know. As to her spiritual testament,I'll contact the foundation and I'll ask about it!If it has been published,I'll post it! I'll certainly talk about your website and forum to prof. Valerio Marinelli who has been collecting all kinds of testimony for over 30 years.Just to give you a few information,prof.Marinelli has taught at Calabria University for 36 years; he is involved in teaching Thermodynamics and Technical Physics at the Dept. of Mechanics.he has also carried out studies about that.But he is also a man of faith and, in spirit of service, he started to gather all the testimonies about Natuzza-thousands and thousands- which would otherwise have gone lost or forgotten.This is how he started this mission because I think there is no other way to define it! Every year pilgrims from the U.S. come over to Italy,the most are in the "cenacoli di preghiera" prayer groups.If you think you can reach Paravati ,let me know so that,together with the foundation, we'll try to help you all also providing English translation.The nearest airport to Paravati is Santa Eufemia, Lametia. Where can I get the book in English on Natuzza Evolo? Thanks so much for providing information on how to order the book. Fascinating! What an enjoyable and interesting read. Thank you for providing the scripture quote from Deuteronomy. If we carefully read this particular scripture we see that it is referring to those who are actively seeking to conjure up or call upon the dead, or upon spirits. Read it carefully and you will see that each group mentioned (divinizers, sorcerers, necromancers, mediums, charmers etc...) all all engaged in seeking to actively contact the dead or spirits. But, what if the dead (souls in purgatory) or spirits come to an individual by the will of God, without the individual even seeking them out or desiring them? This is the case with Natuzza because the dead/purgatorial souls who appeared to her came without her seeking them out in any way. -Certainly Moses and Elijah were long since dead so was that against the prohibition in Deuteronomy? Great response to "Deuteronomy", Glenn. I've read a few misleading English articles about Natuzza in which she was referred to as a "medium" because of her God-given charism of being in frequent contact with the souls of the deceased. I'm sure these have lead to a lot of confusion. 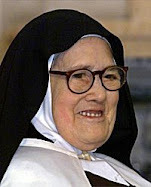 When I first read about her 20 years ago, I too, was cautious about Natuzza... until I read more about her holy life of faith and sacrifice, and her charitable works. Now I think the term medium may have been some sort of mistranslation (from Italian to English), or the people who described Natuzza in such a manner were not familiar with Catholic mysticism. It's important to point out that there were many other credible Catholic mystics who experienced frequent visits from souls in Purgatory begging for prayers, or from Saintly souls from Heaven who had messages from God to deliver. Just to name a few, there's St. Catherine dei Ricci... St. Therese Couderc... St. Padre Pio... and the Servant of God, Sr. Mary Ann Lindmayer. These mystics are not to be confused with the mediums we see or hear about today; who claim to summon spirits at their own whim and through their own supposed "psychic gifts" then dish out random remarks supposedly passed on by spirits. "We are not supposed to summon up the souls — I don't try to get them to come. In spiritism, people try to call them forth. This distinction is quite clear, and we must take it very seriously. If people were only to believe one thing I have said, I would like it to be this: those who engage in spiritism (moving tables and other practices of that kind) think that they are summoning up the souls of the dead. In reality, if there is some response to their call, it is always and without exception Satan and his angels who are answering. People who practice spiritism (diviners, witches, etc.) are doing something very dangerous for themselves and for those who come to them for advice. 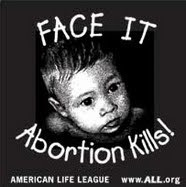 They are up to their necks in lies. It is forbidden, strictly forbidden, to call up the dead. As for me, I have never done so, l do not do so, and I never will do so. When something appears to me, God alone permits it." I'm sure Natuzza would have strongly agreed with Maria's statement. For nearly 40 years, four days a week, Natuzza has received thehundreds of people who seek her counsel. Most are there to ask fornews of their deceased loved ones. Thanks so much for your informative replies! Anyway, if you have any details on St Gemma's appearences to her I would be greatly pleased to receive them. Anyway, thanks again for all the information! Thank you so much for your kind reply and for speaking with Dr. Valerio Marinelli about my question---I sincerely appreciate it! And please do post a note here when anymore of the books on Fortunata "Natuzza" Evolo get translated into english. Thanks again and may God bless you and your loved ones! It seems the question is not whether there is something paranormal or supernatural going on, but from where it is coming. After reading the link to the investigative article on this web page and an article by spiritdaily, I found it extremely disturbing that Natuzza was performing the works of a medium by channeling the actual voice, style of speaking and even the mannerisms of the deceased person. This occurrence is demonic, not of heaven. This is done by so-called channelers and mediums. She would do it upon the request of people, which is conjuring or summoning the deceased spirit. People would ask her to put them "in touch" with dead relatives. What is the redemptive value in that? It is interesting that she lives in an area which is full of belief in witchcraft, sorcery and magic. Also disturbing was the fact that she told others to pray for her because she said herself that, "I am possessed." She had prayers of deliverance and exorcism performed on her by priests. Also, her own pastor even said that much of what she says and advises to others contradicts church teaching. She also performed actions commonly used by so-called psychics when she found lost items or lost persons, status of the dead, medical diagnosis and treatment. With hundreds of people lined up to ask her these questions and test her abilities, this seems to be more like showing off or just satisfying curiosity rather than performing a redemptive act. Her priest also said that when she describes the "beyond" or channels a dead person, there are no Catholic features in her descriptions. The stigmata she had was odd and not traditional stigmata of known saints. The hemography is also a bizarre feature that was often done "on demand" as gifts and to satisfy the vain curiosity of others. The writing and pictures are peculiar and not beautiful and look like they were drawn by a young child, which is strange. Her communion turning to blood in her mouth and her facial blood sweat after communion is also repulsive. Many of her bilocations seemed to serve no redemptive value and the one where she appeared with two dead relatives of a person and the three persons became a single "combined entity" (as described by the seer) is also not in line with Catholic teaching. Whenever mystical phenomena becomes bizarre in nature and contains elements contrary to Church teaching, it should be rejected, even if it is mixed with elements of apparent good. Great comments! Many of the same questions and concerns about certain alleged mystical phenomena in the life of Natuzza were brought to my mind when reading the book. 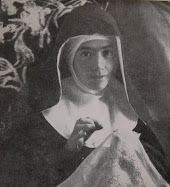 Without a doubt some of the phenomenon (like hemography-- the subject of this article) were very much on the "outskirts" of accepted Catholic mysticism, but nevertheless there has not been any official negative statements or judgements concerning her from the local Bishop or from Rome. And because she in fact lived a very humble and charitible life living out the Catholic faith with piety and devotion this is why at her funeral (a few days after her death on All Saints Day, Nov. 1 2009) six Italian bishops and more than 100 priests concelebrated her funeral Mass along with an estimated 30,000 mourners who came to pay their respects According to this article by the Catholic news website Zenit. In other words, I think it is very safe to assume that a person simply would not have 6 bishops and over 100 priests attending their funeral if they had lived a life contrary to Catholic teaching. I would however wholeheartidly agree that much caution and discernment must accompany alleged mystics--most especially in regards to the alleged mystical graces that they purport to receive. And, at the same time, just because a certain mystical gift like hemography is not common in the lives of the mystics, this does not mean that it is not possibly an authentic mystical grace. Thanks again for your very insightful comments. Thanks for your nice response, Glenn. You have many great articles on your interesting site. Just a final note - I can accept the possibility of hemography being an authentic mystical grace. The characteristics of the hemography and how it seemed at times to be performed almost as a magic trick for others in this case were troubling to me. My biggest red flag was regarding Natuzza's bizarre channeling of deceased spirits that I mentioned at the beginning of my previous post. Her using the deceased's voice, style of speaking and mannerisms while they were supposedly speaking through her is something done exclusively by occultists and is condemned by the Church. The priests and bishops attending her funeral may have been unaware of all the troubling aspects of her life. Also, they are subject to error in this regard - many bishops and priests have shown support for false visionaries in the past. Thank you for your beautiful web site. You may already know this. There is a magazine that is written and published in Poland. It is called, Love One Another. I live in the US and I subscribe. I get copies that are written in English. They send 4 a year for $20. Anyway, they always talk about Mystics. In the last issue that came out - Number 24 - there was a great article on Natuzza Evolo, along with many colored photo's. Thanks for the information--I sincerely appreciate it because I was not aware of this magazine. I recently read an article that connects "Natuzzo" and Saint Pio and the alleged Holy Grail from Saint Peter. I just started trying to read more. Mr. Glenn, have you heard of this? Apparently a book is also coming out about it. Hello Mr. Dalaire. I appreciate Natuzza Evolo too. I like seeing videos of her in youtube even I do not know italian my native langue (portuguese) is close one. I have a question to you. Are you aware of any christian mystic alive nowadays? Thanks for your website it's wonderful! Thanks for your comments--I am really glad to hear that you liked this article. To reply to your question, yes, there is without a doubt a good number of mystics in the world today, and some of them are specially chosen as victim souls. I occasionally receive emails informing about certain ones scattered about the globe, some of whom are likely authentic, others not.. As for myself, I have met three alleged mystics. The problem is, there are many false ones and there is a very real and great danger of being led astray. Thanks again for your message Joao. What a wonderful website! Do you know the words of the "lengthy prayer" that was written about in the last paragraph of this article? Thank you! Sorry, but unfortunately I don't seem to have any record of that prayer. You have done a wonderful article, I love to read about Natuzza Evolo. She must be a very special one that The Lord had sent her to us. I also read the comment of Joao, as far as my knowledge there are two stigmatist that have lived with us know. Fr. 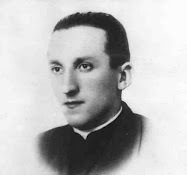 Slatko Sudac, a diocesan priest from Croatia, also has sigmata and many 'ability' something like St. Padre Pio. Fr. Sudac has a trade mark a cross sign on his forhead. Fr. Sudac was borned in 1971, he used to come to the US several times. Padre Pio. Fra Elia lives in Italy and now he has established his convent. 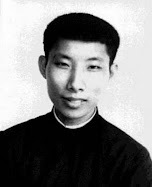 He used to attend seminary in Caphucin like St. Padre Pio. 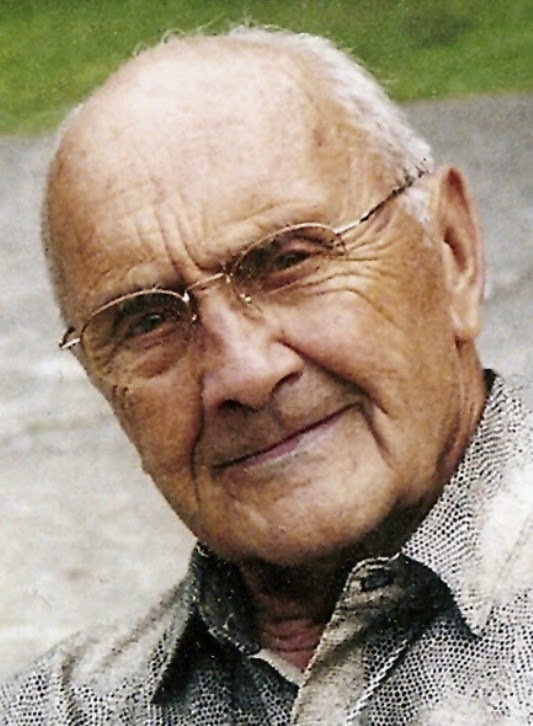 Fra Elia was borned in Italy in 1962. To Mr. Dallaire thank you so much for your article about Natuzza Evolo. Thanks Anthony for your kind comments and for the information that you provided. I am a little familiar with the two persons you mentioned, having read occasional emails and articles about the both of them. -Thanks again and may God bless you and your loved ones! Dear Glen I am currently reading Dr Valerio Marinelli's Volume 1 book on Natuzza in English. Are there any other volumes that are translated into English? If so, how can I obtain a copy? Also are there any other authors that have published in English books on Natuzza? To rely to your question, to my knowledge currently there are no other books about Natuzza in English--hopefully more will be written or translated in the future.